Applied for the Diversity Lottery? Don’t forget to check your status! DV-2017 Entrants are able to check their entry status as of May 3, 2016. Entrants may only check their status by entering their confirmation information at http://www.dvlottery.state.gov/ESC/; the U.S. government will not mail out a notice regarding an Entrant’s status, and embassies and consulates will not provide a list of selectees. DV-2017 Entrants should keep their confirmation number until at least September 30, 2017. Doing Business in the USA – June 9th Seminar – Register Now! Join us on June 9th for a fast paced guide to expanding your sales into the U.S. Whether opening a store front with a U.S. address or partnering with a distribution centre for your ecommerce activity, our seasoned cross-border lawyers, accountants, customs brokers and logistics professionals will present options that will help you determine your export strategy and understand your responsibilities with government departments such as U.S. Customs and Border Protection and immigration. What is considered ‘working’ in the U.S. Some very significant filing fee increases have been proposed by USCIS, now open for public comment in the Federal Register. “On May 4, 2016, USCIS published a notice of proposed rulemaking in the Federal Register inviting public comment, for 60 days, on the proposed U.S. Citizenship and Immigration Services Fee Schedule. The Chief Financial Officers Act of 1990 requires USCIS to conduct fee reviews for the Immigration Examinations Fee Account (IEFA) on a biennial basis. The FY 2016/2017 biennial fee review indicates a 21 percent weighted average fee increase is necessary to ensure full cost recovery. The IEFA represents approximately 94 percent of USCIS’ FY 2015 funding. The remaining funding comes from other fee accounts and a small discretionary appropriation. USCIS has authority to set its IEFA fees at a level that recovers the full cost of providing adjudication and naturalization services. This includes the cost of providing similar services to asylum applicants or other immigrants without charge and any additional costs associated with the administration of the fees collected. USCIS last adjusted its fees in November 2010, based on the FY 2010/2011 Fee Review. To submit a comment, follow the instructions in the notice. 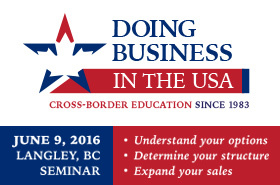 The next Doing Business in the USA trade seminar will be held June 9th at the Signature Sandman Hotel, in Langley, B.C. Co-sponsored by Cascadia Cross-Border Law, Pacific Customs Brokers and UCanTrade, Inc.; the half-day event will provide small to medium-sized businesses with advice on expanding sales in the U.S. Seasoned attorneys, accountants, customs brokers, and logistics professionals will explain your options and responsibilities when engaging in cross-border trade. Our presentation will of course focus on U.S. immigration and work authorization options. With tax season in full swing, a telephone scam has been targeting unsuspecting taxpayers, including noncitizens. Scammers impersonate IRS agents; making aggressive and often convincing phone calls, demanding that the subject owes the IRS money and that if payment is not made immediately the subject will be arrested or deported. The IRS does not pursue payment in this way. ’Tis the Season… for Counterfeit Goods! When many think of CBP – Customs and Border Protection – they immediately think of those who enforce our nation’s immigration laws at airports and along our borders. But with the holidays upon us, it is a perfect time to highlight the fact that a huge amount of the work CBP does is focused on protecting the U.S. economy by facilitating lawful trade, including protecting our borders from dangerous and counterfeit goods. In this day and age when so many of us complete our holiday shopping from the comfort of our living room couches, it is especially important to be aware of the scams and counterfeit products out there. Along the U.S.-Canada border, online shopping has even more of a presence: many online retailers will not ship to Canada; so Canadian shoppers will establish U.S. mail boxes where their item can be shipped, typically in border communities where they can easily travel to pick up their item (note: this is not a problem as long as the proper customs declarations are made). The Department of State’s website for the 2017 Diversity Visa program (DV-2017) is now open! The entry submission period for DV-2017 runs from October 1, 2015 to November 3, 2015. The entry form must be submitted during this period, and entries may only be submitted online at https://www.dvlottery.state.gov/. The U.S. Department of State provides a helpful step-by-step guidance on the program and how to submit an entry at https://www.youtube.com/watch?v=tOQlh2d2EbQ&feature=youtu.be. Instructions are also available at http://travel.state.gov/content/dam/visas/Diversity-Visa/DV-Instructions-Translations/DV-2017-Instructions-Translations/DV-2017%20Instructions%20and%20FAQs.pdf. DV-2017 Entrants will begin to be able to check their entry status starting May 3, 2016. Entrants may only check their status by entering their confirmation information at http://www.dvlottery.state.gov/ESC/; the U.S. government will not mail out a notice regarding an Entrant’s status, and embassies and consulates will not provide a list of selectees. DV-2017 Entrants should keep their confirmation number until at least September 30, 2017. The list below shows the countries whose natives are eligible for DV-2017, grouped by geographic region. Dependent areas overseas are included within the region of the governing country. The countries whose natives are not eligible for the DV-2017 program were identified by USCIS, according to the formula in Section 203(c) of the INA. The countries whose natives are not eligible for the DV program (because they are the principal source countries of Family-Sponsored and Employment-Based immigration or “high-admission” countries) are noted after the respective regional lists. **Natives of the following Asia Region countries are not eligible for this year’s Diversity Visa program: Bangladesh, China (mainland-born), India, Pakistan, South Korea, Philippines, and Vietnam. Hong Kong S.A.R. (Asia region), Macau S.A.R. (Europe region), and Taiwan (Asia region) do qualify and are listed here. **Natives of the following European countries are not eligible for this year’s DV program: Great Britain (United Kingdom). Great Britain (United Kingdom) includes the following dependent areas: Anguilla, Bermuda, British Virgin Islands, Cayman Islands, Falkland Islands, Gibraltar, Montserrat, Pitcairn, St. Helena, and Turks and Caicos Islands. Note that for purposes of the diversity program only, Northern Ireland is treated separately; Northern Ireland does qualify and is listed among the qualifying areas. Macau S.A.R. does qualify and is listed above. Countries in this region whose natives are not eligible for this year’s DV program: Brazil, Colombia, Dominican Republic, Ecuador, El Salvador, Haiti, Jamaica, Mexico, and Peru. Our world is facing a humanitarian crisis of epic proportions; 2015 alone has seen hundreds of thousands of people risking their lives—and losing their lives— to flee war, violence, poverty, persecution, and other harsh or tragic circumstances in their home countries. Millions more are displaced within their home countries. Where and how to provide refuge is an issue that cannot be ignored and a conversation that must be had. Sadly, it took a tragic photo of a drowned child on a European beach to capture much of the world’s attention – but the issue is finally at the forefront; with world leaders offering their homes, and even the Pope taking a stance. However in having this conversation, many people are unsure of the appropriate language to use. Refugee? Migrant? Asylum-seeker? Immigrant? First and foremost, we must be reminded that these are human beings; families like yours and mine. Refugee: Generally, a refugee is a person who has been forced to flee their home country due to persecution on account of race, religion, nationality, political opinion, or membership in a particular social group. A person who qualifies as a refugee pursuant to the United Nations’ 1951 Refugee Convention will be afforded a number of protections under international law; including, most significantly, not being immediately deported back to their country of persecution. Migrant: A migrant is a person who is resettling in another country, or in different region or safe place within their home country, in search of a better life. The umbrella term migrant can be used to describe any person who has moved to a new place from their home country, including those who do so voluntarily and under positive circumstances. For this reason, the use of this term for some is uncomfortable, as it lacks the urgency of a term like refugee and tends to connote voluntariness. In fact, the term migrant covers millions of displaced persons worldwide who are forced to flee very harsh conditions in their home country, who do not flee because they want to, but because they must. While a great many migrants are in fact refugees, the term is not restricted to a person fleeing persecution. A person fleeing poverty is a prime example; a person displaced due to a disaster is another example. Generally, such a migrant is not afforded protections under international law; unless that person qualifies as a refugee, a migrant’s entry into a particular country will be processed pursuant to that country’s immigration laws—without the protections afforded by the 1951 Refugee Convention. Asylum-seeker: An asylum-seeker is a person who is fleeing persecution in their home country and seeking status as a refugee in a safe country, but whose claims to refugee status have not yet been adjudicated. Many migrants are asylum-seekers, and will become refugees upon adjudication of their legal claims. Immigrant: The term immigrant is a general term that can be used to describe any type of person who has left their home country as a migrant and is settled at the new country they will call home. Such a person could have been fleeing persecution as an asylum-seeker and then a refugee; such a person could also have been fleeing poverty or some other harsh conditions that do not rise to what international law deems to be persecution; such a person could also have left their home country for positive reasons. While the term being used to describe a person is significant in a legal sense, it is crucial to remember that whatever their legal status, these are all people we are talking about— grandparents, moms and dads, brothers and sisters, children. Each is a unique human being facing a unique set of circumstances, who must be treated individually and with respect.